Navigation, Moonroof, Heated Seats, Third Row Seat, Captains Chairs, All Wheel Drive, Power Liftgate. SATIN STEEL METALLIC exterior and DARK GALVANIZED W/EBONY ACCENTS interior, Premium trim. FUEL EFFICIENT 25 MPG Hwy/17 MPG City! CLICK NOW! Third Row Seat, All Wheel Drive, Quad Bucket Seats, Power Liftgate, Rear Air, Heated Driver Seat, Heated Rear Seat, Cooled Driver Seat, Back-Up Camera, Premium Sound System, Onboard Communications System, Chrome Wheels, Remote Engine Start, Dual Zone A/C, Heated Seats Rear Spoiler, Keyless Entry, Remote Trunk Release, Privacy Glass, Steering Wheel Controls. MOONROOF, FRONT POWER SLIDING transparent glass with rear fixed skylight, TRAILERING PACKAGE 5000 lbs. includes (V08) heavy-duty engine cooling system and trailer hitch, AUDIO SYSTEM, BUICK INFOTAINMENT SYSTEM WITH NAVIGATION, AM/FM STEREO, SIRIUSXM, WITH 8" DIAGONAL COLOR TOUCH SCREEN includes 2 USB ports inside center console, auxiliary input jack, and Bluetooth streaming for audio and select phones and Phone Integration for Apple CarPlay and Android Auto capability for compatible phone, ENGINE, 3.6L V6, SIDI, VVT STOP/START (310 hp [231 kW] @ 6800 rpm, 266 lb-ft of torque [359 N-m] @ 2800 rpm) (STD), TRANSMISSION, 9-SPEED AUTOMATIC (STD). 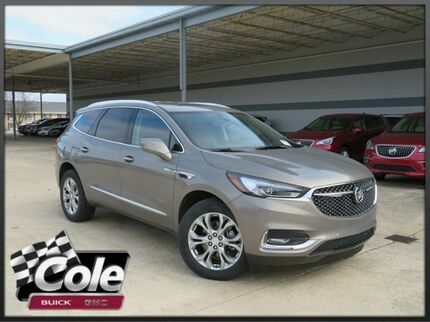 Buick Premium with SATIN STEEL METALLIC exterior and DARK GALVANIZED W/EBONY ACCENTS interior features a V6 Cylinder Engine with 310 HP at 6800 RPM*. KBB.com explains "The cabin is downright serene thanks to the attention to detail in controlling noise, vibration and harshness.". Great Gas Mileage: 25 MPG Hwy. Heated Seats, Third Row Seat, Nav System, Back-Up Camera, Onboard Communications System, Remote Engine Start, Rear Air. Essence trim, SUMMIT WHITE exterior and SHALE WITH EBONY ACCENTS interior. EPA 26 MPG Hwy/18 MPG City! CLICK NOW! 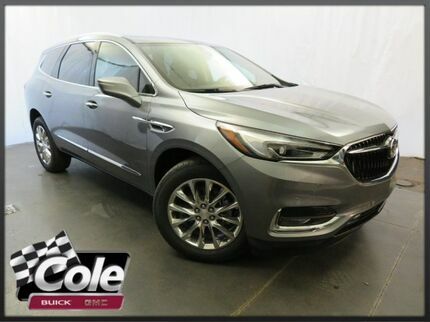 Third Row Seat, Quad Bucket Seats, Power Liftgate, Rear Air, Heated Driver Seat, Back-Up Camera, Onboard Communications System, Aluminum Wheels, Remote Engine Start, Dual Zone A/C, Heated Seats Rear Spoiler, Keyless Entry, Privacy Glass, Remote Trunk Release, Steering Wheel Controls. AUDIO SYSTEM, BUICK INFOTAINMENT SYSTEM WITH NAVIGATION, AM/FM STEREO, SIRIUSXM, WITH 8" DIAGONAL COLOR TOUCH SCREEN includes 2 USB ports inside center console, auxiliary input jack, and Bluetooth streaming for audio and select phones and Phone Integration for Apple CarPlay and Android Auto capability for compatible phone (Includes (KI6) 120-volt outlet. ), TRANSMISSION, 9-SPEED AUTOMATIC (STD), ENGINE, 3.6L V6, SIDI, VVT STOP/START (310 hp [231 kW] @ 6800 rpm, 266 lb-ft of torque [359 N-m] @ 2800 rpm) (STD). Buick Essence with SUMMIT WHITE exterior and SHALE WITH EBONY ACCENTS interior features a V6 Cylinder Engine with 310 HP at 6800 RPM*. Heated Seats, NAV, Sunroof, 3rd Row Seat, All Wheel Drive, Power Liftgate, Quad Seats, TRAILERING PACKAGE. EPA 25 MPG Hwy/17 MPG City! EBONY TWILIGHT METALLIC exterior and CHESTNUT WITH EBONY ACCENTS interior, Avenir trim CLICK ME! Third Row Seat, Sunroof, All Wheel Drive, Quad Bucket Seats, Power Liftgate, Rear Air, Heated Driver Seat, Heated Rear Seat, Cooled Driver Seat, Back-Up Camera, Premium Sound System, Onboard Communications System, Aluminum Wheels, Remote Engine Start, Dual Zone A/C Rear Spoiler, Remote Trunk Release, Privacy Glass, Keyless Entry, Child Safety Locks. TRAILERING PACKAGE 5000 lbs. includes (V08) heavy-duty engine cooling system and trailer hitch, AUDIO SYSTEM, BUICK INFOTAINMENT SYSTEM WITH NAVIGATION, AM/FM STEREO, SIRIUSXM, WITH 8" DIAGONAL COLOR TOUCH SCREEN includes 2 USB ports inside center console, auxiliary input jack, and Bluetooth streaming for audio and select phones and Phone Integration for Apple CarPlay and Android Auto capability for compatible phone, TRANSMISSION, 9-SPEED AUTOMATIC (STD), ENGINE, 3.6L V6, SIDI, VVT STOP/START (310 hp [231 kW] @ 6800 rpm, 266 lb-ft of torque [359 N-m] @ 2800 rpm) (STD). 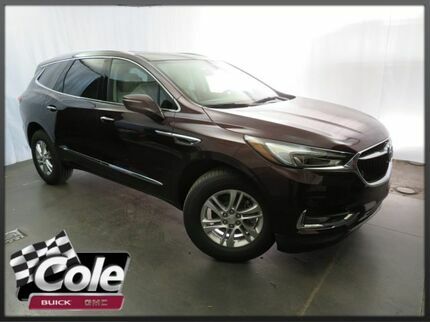 Buick Avenir with EBONY TWILIGHT METALLIC exterior and CHESTNUT WITH EBONY ACCENTS interior features a V6 Cylinder Engine with 310 HP at 6800 RPM*. Heated Seats, Third Row Seat, Onboard Communications System, Remote Engine Start, Dual Zone A/C, Rear Air. FUEL EFFICIENT 26 MPG Hwy/18 MPG City! Essence trim, PEPPERDUST METALLIC exterior and SHALE WITH EBONY ACCENTS interior READ MORE! 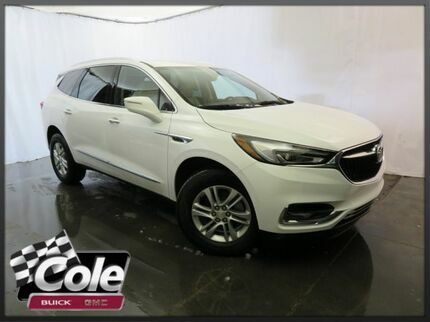 Third Row Seat, Quad Bucket Seats, Power Liftgate, Rear Air, Heated Driver Seat, Back-Up Camera, Onboard Communications System, Aluminum Wheels, Remote Engine Start, Dual Zone A/C, Heated Seats Rear Spoiler, Remote Trunk Release, Keyless Entry, Privacy Glass, Child Safety Locks. 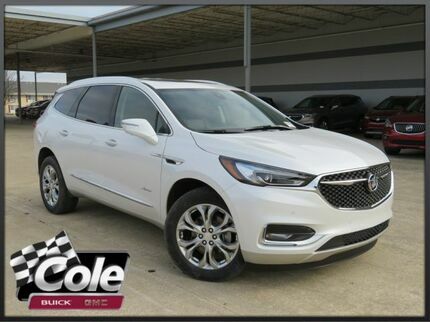 TRANSMISSION, 9-SPEED AUTOMATIC (STD), ENGINE, 3.6L V6, SIDI, VVT STOP/START (310 hp [231 kW] @ 6800 rpm, 266 lb-ft of torque [359 N-m] @ 2800 rpm) (STD), AUDIO SYSTEM, BUICK INFOTAINMENT SYSTEM, AM/FM STEREO, SIRIUSXM, WITH 8" DIAGONAL COLOR TOUCH SCREEN includes 2 USB ports inside center console, Bluetooth streaming for audio and select phones and Phone Integration for Apple CarPlay and Android Auto capability for compatible phone (STD). Buick Essence with PEPPERDUST METALLIC exterior and SHALE WITH EBONY ACCENTS interior features a V6 Cylinder Engine with 310 HP at 6800 RPM*. KBB.com explains "The cabin is downright serene thanks to the attention to detail in controlling noise, vibration and harshness.". Great Gas Mileage: 26 MPG Hwy. NAV, 3rd Row Seat, Sunroof, Heated Seats, Quad Seats, All Wheel Drive, Power Liftgate, Tow Hitch, Alloy Wheels. EPA 25 MPG Hwy/17 MPG City! Premium trim, SATIN STEEL METALLIC exterior and DARK GALVANIZED W/EBONY ACCENTS interior READ MORE! "The cabin is downright serene thanks to the attention to detail in controlling noise, vibration and harshness." -KBB.com. Great Gas Mileage: 25 MPG Hwy. 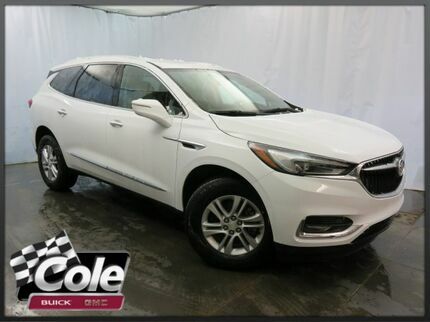 Third Row Seat, Moonroof, Nav System, Heated Seats, Quad Bucket Seats, All Wheel Drive, Power Liftgate. FUEL EFFICIENT 25 MPG Hwy/17 MPG City! WHITE FROST TRICOAT exterior and SHALE WITH EBONY ACCENTS interior, Essence trim CLICK NOW! 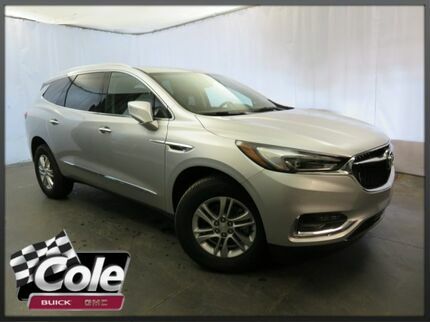 Third Row Seat, All Wheel Drive, Quad Bucket Seats, Power Liftgate, Rear Air, Heated Driver Seat, Back-Up Camera, Onboard Communications System, Aluminum Wheels, Remote Engine Start, Dual Zone A/C, Heated Seats Rear Spoiler, Privacy Glass, Keyless Entry, Remote Trunk Release, Child Safety Locks. MOONROOF, FRONT POWER SLIDING transparent glass with rear fixed skylight, TRAILERING PACKAGE 5000 lbs. includes (V08) heavy-duty engine cooling system and trailer hitch, AUDIO SYSTEM, BUICK INFOTAINMENT SYSTEM WITH NAVIGATION, AM/FM STEREO, SIRIUSXM, WITH 8" DIAGONAL COLOR TOUCH SCREEN includes 2 USB ports inside center console, auxiliary input jack, and Bluetooth streaming for audio and select phones and Phone Integration for Apple CarPlay and Android Auto capability for compatible phone (Includes (KI6) 120-volt outlet. ), ENGINE, 3.6L V6, SIDI, VVT STOP/START (310 hp [231 kW] @ 6800 rpm, 266 lb-ft of torque [359 N-m] @ 2800 rpm) (STD), TRANSMISSION, 9-SPEED AUTOMATIC (STD). Buick Essence with WHITE FROST TRICOAT exterior and SHALE WITH EBONY ACCENTS interior features a V6 Cylinder Engine with 310 HP at 6800 RPM*. NAV, Sunroof, 3rd Row Seat, Heated Seats, Quad Seats, All Wheel Drive, Power Liftgate, Alloy Wheels. Essence trim, BLACK CHERRY METALLIC exterior and SHALE WITH EBONY ACCENTS interior. FUEL EFFICIENT 25 MPG Hwy/17 MPG City! CLICK NOW! 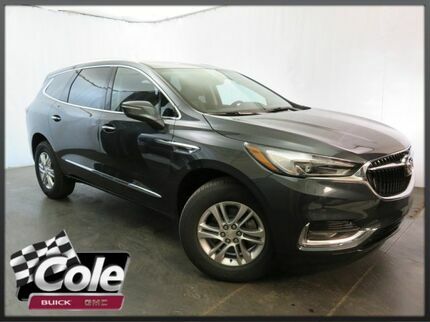 Third Row Seat, All Wheel Drive, Quad Bucket Seats, Power Liftgate, Rear Air, Heated Driver Seat, Back-Up Camera, Onboard Communications System, Aluminum Wheels, Remote Engine Start, Dual Zone A/C, Heated Seats. Rear Spoiler, Privacy Glass, Keyless Entry, Remote Trunk Release, Child Safety Locks. MOONROOF, FRONT POWER SLIDING transparent glass with rear fixed skylight, TRAILERING PACKAGE 5000 lbs. includes (V08) heavy-duty engine cooling system and trailer hitch, AUDIO SYSTEM, BUICK INFOTAINMENT SYSTEM WITH NAVIGATION, AM/FM STEREO, SIRIUSXM, WITH 8" DIAGONAL COLOR TOUCH SCREEN includes 2 USB ports inside center console, auxiliary input jack, and Bluetooth streaming for audio and select phones and Phone Integration for Apple CarPlay and Android Auto capability for compatible phone (Includes (KI6) 120-volt outlet. ), ENGINE, 3.6L V6, SIDI, VVT STOP/START (310 hp [231 kW] @ 6800 rpm, 266 lb-ft of torque [359 N-m] @ 2800 rpm) (STD), TRANSMISSION, 9-SPEED AUTOMATIC (STD). Buick Essence with BLACK CHERRY METALLIC exterior and SHALE WITH EBONY ACCENTS interior features a V6 Cylinder Engine with 310 HP at 6800 RPM*. KBB.com's review says "The cabin is downright serene thanks to the attention to detail in controlling noise, vibration and harshness.". Great Gas Mileage: 25 MPG Hwy. Navigation, 3rd Row Seat, Heated Seats, All Wheel Drive, Power Liftgate, Rear Air, TRAILERING PACKAGE. Essence trim, DARK SLATE METALLIC exterior and DARK GALVANIZED W/EBONY ACCENTS interior. FUEL EFFICIENT 25 MPG Hwy/17 MPG City! SEE MORE! TRAILERING PACKAGE 5000 lbs. includes (V08) heavy-duty engine cooling system and trailer hitch, AUDIO SYSTEM, BUICK INFOTAINMENT SYSTEM WITH NAVIGATION, AM/FM STEREO, SIRIUSXM, WITH 8" DIAGONAL COLOR TOUCH SCREEN includes 2 USB ports inside center console, auxiliary input jack, and Bluetooth streaming for audio and select phones and Phone Integration for Apple CarPlay and Android Auto capability for compatible phone (Includes (KI6) 120-volt outlet. ), ENGINE, 3.6L V6, SIDI, VVT STOP/START (310 hp [231 kW] @ 6800 rpm, 266 lb-ft of torque [359 N-m] @ 2800 rpm) (STD), TRANSMISSION, 9-SPEED AUTOMATIC (STD). 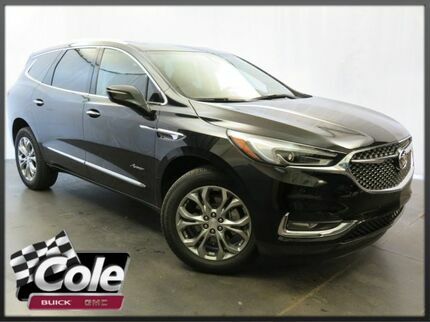 Buick Essence with DARK SLATE METALLIC exterior and DARK GALVANIZED W/EBONY ACCENTS interior features a V6 Cylinder Engine with 310 HP at 6800 RPM*. Third Row Seat, Heated Seats, Nav System, Rear Air, Back-Up Camera, Onboard Communications System, Power Liftgate. Essence trim, SUMMIT WHITE exterior and SHALE WITH EBONY ACCENTS interior. FUEL EFFICIENT 25 MPG Hwy/17 MPG City! AND MORE! 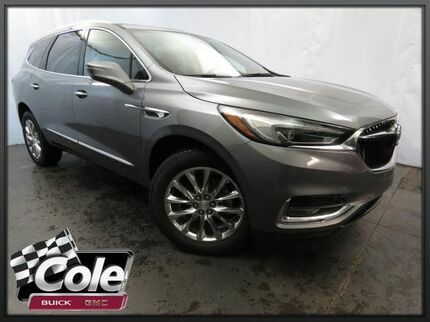 Third Row Seat, All Wheel Drive, Quad Bucket Seats, Power Liftgate, Rear Air, Heated Driver Seat, Back-Up Camera, Onboard Communications System, Aluminum Wheels, Remote Engine Start, Dual Zone A/C, Heated Seats. Rear Spoiler, Remote Trunk Release, Privacy Glass, Keyless Entry, Child Safety Locks. Navigation, Sunroof, 3rd Row Seat, Heated Seats, Captains Chairs, All Wheel Drive, Power Liftgate. Premium trim, BLACK CHERRY METALLIC exterior and SHALE WITH EBONY ACCENTS interior. FUEL EFFICIENT 25 MPG Hwy/17 MPG City! READ MORE! 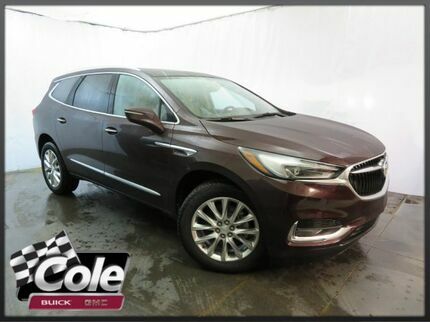 Third Row Seat, All Wheel Drive, Quad Bucket Seats, Power Liftgate, Rear Air, Heated Driver Seat, Heated Rear Seat, Cooled Driver Seat, Back-Up Camera, Premium Sound System, Onboard Communications System, Chrome Wheels, Remote Engine Start, Dual Zone A/C, Heated Seats. Rear Spoiler, Keyless Entry, Remote Trunk Release, Privacy Glass, Steering Wheel Controls. MOONROOF, FRONT POWER SLIDING transparent glass with rear fixed skylight, TRAILERING PACKAGE 5000 lbs. includes (V08) heavy-duty engine cooling system and trailer hitch, AUDIO SYSTEM, BUICK INFOTAINMENT SYSTEM WITH NAVIGATION, AM/FM STEREO, SIRIUSXM, WITH 8" DIAGONAL COLOR TOUCH SCREEN includes 2 USB ports inside center console, auxiliary input jack, and Bluetooth streaming for audio and select phones and Phone Integration for Apple CarPlay and Android Auto capability for compatible phone, ENGINE, 3.6L V6, SIDI, VVT STOP/START (310 hp [231 kW] @ 6800 rpm, 266 lb-ft of torque [359 N-m] @ 2800 rpm) (STD), TRANSMISSION, 9-SPEED AUTOMATIC (STD). 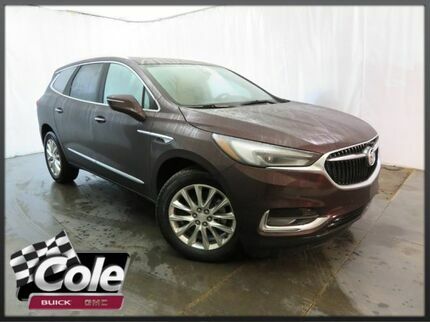 Buick Premium with BLACK CHERRY METALLIC exterior and SHALE WITH EBONY ACCENTS interior features a V6 Cylinder Engine with 310 HP at 6800 RPM*. Moonroof, Navigation, Heated Seats, Third Row Seat, Captains Chairs, All Wheel Drive, Chrome Wheels. FUEL EFFICIENT 25 MPG Hwy/17 MPG City! EBONY TWILIGHT METALLIC exterior and DARK GALVANIZED W/EBONY ACCENTS interior, Premium trim CLICK ME! MOONROOF, FRONT POWER SLIDING transparent glass with rear fixed skylight, TRAILERING PACKAGE 5000 lbs. includes (V08) heavy-duty engine cooling system and trailer hitch, AUDIO SYSTEM, BUICK INFOTAINMENT SYSTEM WITH NAVIGATION, AM/FM STEREO, SIRIUSXM, WITH 8" DIAGONAL COLOR TOUCH SCREEN includes 2 USB ports inside center console, auxiliary input jack, and Bluetooth streaming for audio and select phones and Phone Integration for Apple CarPlay and Android Auto capability for compatible phone, ENGINE, 3.6L V6, SIDI, VVT STOP/START (310 hp [231 kW] @ 6800 rpm, 266 lb-ft of torque [359 N-m] @ 2800 rpm) (STD), TRANSMISSION, 9-SPEED AUTOMATIC (STD). 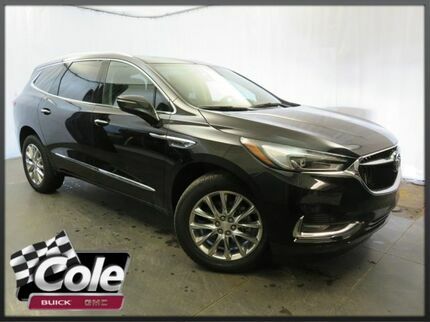 Buick Premium with EBONY TWILIGHT METALLIC exterior and DARK GALVANIZED W/EBONY ACCENTS interior features a V6 Cylinder Engine with 310 HP at 6800 RPM*. Nav System, Third Row Seat, Heated Seats, All Wheel Drive, Power Liftgate, Rear Air, TRAILERING PACKAGE. QUICKSILVER METALLIC exterior and DARK GALVANIZED W/EBONY ACCENTS interior, Essence trim. EPA 25 MPG Hwy/17 MPG City! SEE MORE! TRAILERING PACKAGE 5000 lbs. includes (V08) heavy-duty engine cooling system and trailer hitch, AUDIO SYSTEM, BUICK INFOTAINMENT SYSTEM WITH NAVIGATION, AM/FM STEREO, SIRIUSXM, WITH 8" DIAGONAL COLOR TOUCH SCREEN includes 2 USB ports inside center console, auxiliary input jack, and Bluetooth streaming for audio and select phones and Phone Integration for Apple CarPlay and Android Auto capability for compatible phone (Includes (KI6) 120-volt outlet. ), ENGINE, 3.6L V6, SIDI, VVT STOP/START (310 hp [231 kW] @ 6800 rpm, 266 lb-ft of torque [359 N-m] @ 2800 rpm) (STD), TRANSMISSION, 9-SPEED AUTOMATIC (STD). Buick Essence with QUICKSILVER METALLIC exterior and DARK GALVANIZED W/EBONY ACCENTS interior features a V6 Cylinder Engine with 310 HP at 6800 RPM*. Navigation, Third Row Seat, Moonroof, Heated Seats, Captains Chairs, All Wheel Drive, Power Liftgate. WHITE FROST TRICOAT exterior and CHESTNUT WITH EBONY ACCENTS interior, Avenir trim. FUEL EFFICIENT 25 MPG Hwy/17 MPG City! AND MORE! 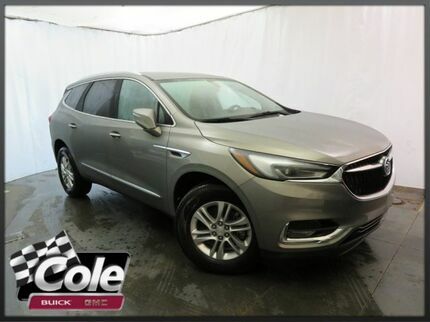 Third Row Seat, Sunroof, All Wheel Drive, Quad Bucket Seats, Power Liftgate, Rear Air, Heated Driver Seat, Heated Rear Seat, Cooled Driver Seat, Back-Up Camera, Premium Sound System, Onboard Communications System, Aluminum Wheels, Remote Engine Start, Dual Zone A/C. Rear Spoiler, Remote Trunk Release, Privacy Glass, Keyless Entry, Child Safety Locks. AVENIR TECHNOLOGY PACKAGE includes (KSG) adaptive full-speed cruise control with Stop/GO, (UGN) Forward Automatic Braking, (VTI) Grille front shutters, active only and (CWM) Premium Suspension Package, TRAILERING PACKAGE 5000 lbs. includes (V08) heavy-duty engine cooling system and trailer hitch, ENGINE, 3.6L V6, SIDI, VVT STOP/START (310 hp [231 kW] @ 6800 rpm, 266 lb-ft of torque [359 N-m] @ 2800 rpm) (STD), TRANSMISSION, 9-SPEED AUTOMATIC (STD), AUDIO SYSTEM, BUICK INFOTAINMENT SYSTEM WITH NAVIGATION, AM/FM STEREO, SIRIUSXM, WITH 8" DIAGONAL COLOR TOUCH SCREEN includes 2 USB ports inside center console, auxiliary input jack, and Bluetooth streaming for audio and select phones and Phone Integration for Apple CarPlay and Android Auto capability for compatible phone. 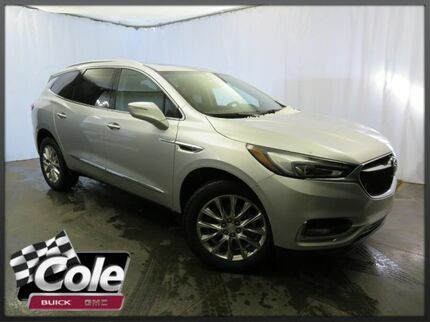 Buick Avenir with WHITE FROST TRICOAT exterior and CHESTNUT WITH EBONY ACCENTS interior features a V6 Cylinder Engine with 310 HP at 6800 RPM*. Third Row Seat, Heated Seats, Nav System, All Wheel Drive, Power Liftgate, Rear Air, TRANSMISSION, 9-SPEED AUTOMATIC. Essence trim, SUMMIT WHITE exterior and SHALE WITH EBONY ACCENTS interior. EPA 25 MPG Hwy/17 MPG City! READ MORE! TRAILERING PACKAGE 5000 lbs. includes (V08) heavy-duty engine cooling system and trailer hitch, AUDIO SYSTEM, BUICK INFOTAINMENT SYSTEM WITH NAVIGATION, AM/FM STEREO, SIRIUSXM, WITH 8" DIAGONAL COLOR TOUCH SCREEN includes 2 USB ports inside center console, auxiliary input jack, and Bluetooth streaming for audio and select phones and Phone Integration for Apple CarPlay and Android Auto capability for compatible phone (Includes (KI6) 120-volt outlet. ), ENGINE, 3.6L V6, SIDI, VVT STOP/START (310 hp [231 kW] @ 6800 rpm, 266 lb-ft of torque [359 N-m] @ 2800 rpm) (STD), TRANSMISSION, 9-SPEED AUTOMATIC (STD). Buick Essence with SUMMIT WHITE exterior and SHALE WITH EBONY ACCENTS interior features a V6 Cylinder Engine with 310 HP at 6800 RPM*. Nav System, Third Row Seat, Moonroof, Heated Seats, Quad Bucket Seats, All Wheel Drive, Power Liftgate, Chrome Wheels. EPA 25 MPG Hwy/17 MPG City! Premium trim, BLACK CHERRY METALLIC exterior and SHALE WITH EBONY ACCENTS interior SEE MORE! NAV, Sunroof, Heated Seats, 3rd Row Seat, Quad Seats, All Wheel Drive, Power Liftgate, AVENIR TECHNOLOGY PACKAGE. PEPPERDUST METALLIC exterior and CHESTNUT WITH EBONY ACCENTS interior, Avenir trim. EPA 25 MPG Hwy/17 MPG City! AND MORE! AVENIR TECHNOLOGY PACKAGE includes (KSG) adaptive full-speed cruise control with Stop/GO, (UGN) Forward Automatic Braking, (VTI) Grille front shutters, active only and (CWM) Premium Suspension Package, TRAILERING PACKAGE 5000 lbs. includes (V08) heavy-duty engine cooling system and trailer hitch, ENGINE, 3.6L V6, SIDI, VVT STOP/START (310 hp [231 kW] @ 6800 rpm, 266 lb-ft of torque [359 N-m] @ 2800 rpm) (STD), TRANSMISSION, 9-SPEED AUTOMATIC (STD), AUDIO SYSTEM, BUICK INFOTAINMENT SYSTEM WITH NAVIGATION, AM/FM STEREO, SIRIUSXM, WITH 8" DIAGONAL COLOR TOUCH SCREEN includes 2 USB ports inside center console, auxiliary input jack, and Bluetooth streaming for audio and select phones and Phone Integration for Apple CarPlay and Android Auto capability for compatible phone. 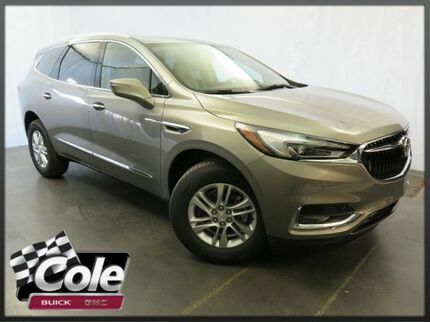 Buick Avenir with PEPPERDUST METALLIC exterior and CHESTNUT WITH EBONY ACCENTS interior features a V6 Cylinder Engine with 310 HP at 6800 RPM*. Moonroof, Nav System, Heated Seats, Third Row Seat, Quad Bucket Seats, All Wheel Drive, Power Liftgate, Hitch. EPA 25 MPG Hwy/17 MPG City! Avenir trim, PEPPERDUST METALLIC exterior and CHESTNUT WITH EBONY ACCENTS interior SEE MORE! Heated Seats, NAV, 3rd Row Seat, All Wheel Drive, Power Liftgate, Rear Air, TRANSMISSION, 9-SPEED AUTOMATIC. Essence trim, PEPPERDUST METALLIC exterior and SHALE WITH EBONY ACCENTS interior. EPA 25 MPG Hwy/17 MPG City! READ MORE! TRAILERING PACKAGE 5000 lbs. includes (V08) heavy-duty engine cooling system and trailer hitch, AUDIO SYSTEM, BUICK INFOTAINMENT SYSTEM WITH NAVIGATION, AM/FM STEREO, SIRIUSXM, WITH 8" DIAGONAL COLOR TOUCH SCREEN includes 2 USB ports inside center console, auxiliary input jack, and Bluetooth streaming for audio and select phones and Phone Integration for Apple CarPlay and Android Auto capability for compatible phone (Includes (KI6) 120-volt outlet. ), ENGINE, 3.6L V6, SIDI, VVT STOP/START (310 hp [231 kW] @ 6800 rpm, 266 lb-ft of torque [359 N-m] @ 2800 rpm) (STD), TRANSMISSION, 9-SPEED AUTOMATIC (STD). Buick Essence with PEPPERDUST METALLIC exterior and SHALE WITH EBONY ACCENTS interior features a V6 Cylinder Engine with 310 HP at 6800 RPM*. Heated Seats, 3rd Row Seat, Navigation, Sunroof, ENGINE, 3.6L V6, SIDI, VVT STOP/START... Power Liftgate, Alloy Wheels. EPA 25 MPG Hwy/17 MPG City! RED QUARTZ TINTCOAT exterior and SHALE WITH EBONY ACCENTS interior, Premium trim AND MORE! MOONROOF, FRONT POWER SLIDING transparent glass with rear fixed skylight, TRAILERING PACKAGE 5000 lbs. includes (V08) heavy-duty engine cooling system and trailer hitch, AUDIO SYSTEM, BUICK INFOTAINMENT SYSTEM WITH NAVIGATION, AM/FM STEREO, SIRIUSXM, WITH 8" DIAGONAL COLOR TOUCH SCREEN includes 2 USB ports inside center console, auxiliary input jack, and Bluetooth streaming for audio and select phones and Phone Integration for Apple CarPlay and Android Auto capability for compatible phone, ENGINE, 3.6L V6, SIDI, VVT STOP/START (310 hp [231 kW] @ 6800 rpm, 266 lb-ft of torque [359 N-m] @ 2800 rpm) (STD), TRANSMISSION, 9-SPEED AUTOMATIC (STD). 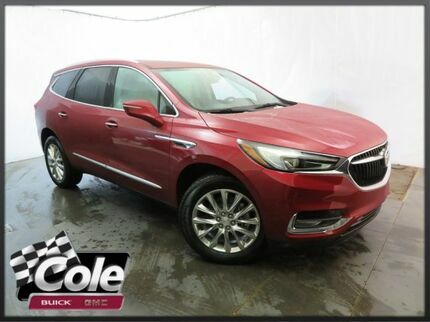 Buick Premium with RED QUARTZ TINTCOAT exterior and SHALE WITH EBONY ACCENTS interior features a V6 Cylinder Engine with 310 HP at 6800 RPM*. Navigation, 3rd Row Seat, Sunroof, Heated Seats, Captains Chairs, All Wheel Drive, Power Liftgate, Trailer Hitch. Premium trim, QUICKSILVER METALLIC exterior and DARK GALVANIZED W/EBONY ACCENTS interior. EPA 25 MPG Hwy/17 MPG City! SEE MORE! MOONROOF, FRONT POWER SLIDING transparent glass with rear fixed skylight, TRAILERING PACKAGE 5000 lbs. includes (V08) heavy-duty engine cooling system and trailer hitch, AUDIO SYSTEM, BUICK INFOTAINMENT SYSTEM WITH NAVIGATION, AM/FM STEREO, SIRIUSXM, WITH 8" DIAGONAL COLOR TOUCH SCREEN includes 2 USB ports inside center console, auxiliary input jack, and Bluetooth streaming for audio and select phones and Phone Integration for Apple CarPlay and Android Auto capability for compatible phone, ENGINE, 3.6L V6, SIDI, VVT STOP/START (310 hp [231 kW] @ 6800 rpm, 266 lb-ft of torque [359 N-m] @ 2800 rpm) (STD), TRANSMISSION, 9-SPEED AUTOMATIC (STD). 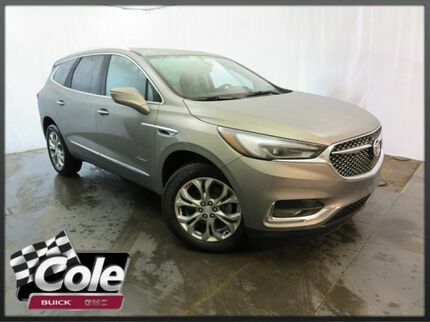 Buick Premium with QUICKSILVER METALLIC exterior and DARK GALVANIZED W/EBONY ACCENTS interior features a V6 Cylinder Engine with 310 HP at 6800 RPM*.